In case you didn’t know, I’m usually a get-there-as-quickly-as-we-can kinda guy. So when Ann told me that she and Meghan preferred to avoid the interstate on trips around Nebraska, I felt a little queasy. The thought of trailing long lines of cars and putting along behind slow moving tractors with no chance to pass made my palms sweat and my heart race. As long as I was driving, we’d be interstate people, I thought. 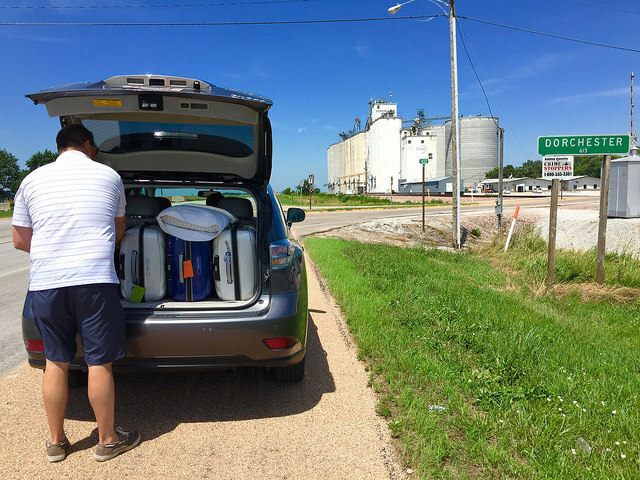 When we headed out on our annual Nebraska trip this summer, our first planned stop was in Hastings, Nebraska, about 77 miles straight west of Crete. We started out on and stuck to Highway 6 merely because using the interstate would have taken us 28 miles out of our way. We made it a whole 7 miles down the highway before we had to stop to get something out of the back of the car. I’ve got to tell you — I died a little inside when she said those words. 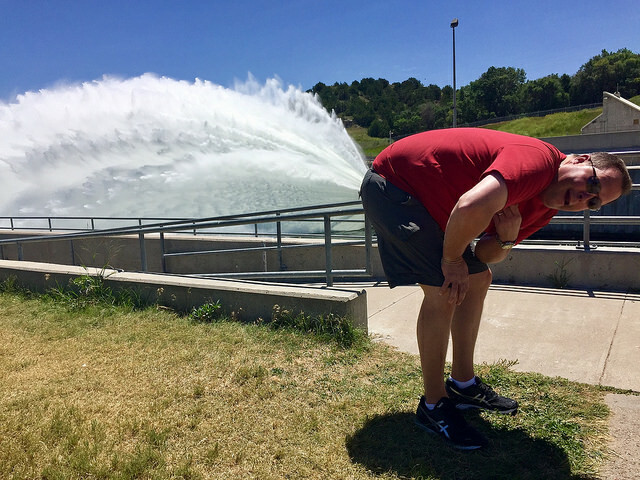 Then, trusting my wife, I took a deep breath and reassured myself that we didn’t really have to be there by a certain time. I turned the steering wheel and somewhat reluctantly headed down Highway 30. Little did I know at that time that I was not only heading to North Platte, but also into a new appreciation for a different pace of travel. First, let me say that my fears of long lines of cars were unfounded. It turns out, those stretches of cars were actually on I-80 and not the highway. We had the road to ourselves. Sure we had to slow down every 10-15 miles for a little town, but it was fun to actually see the towns, parks, and attractions that had always just been names on interstate turnoff signs before. Like this stop at the dam at Lake McConaughy. 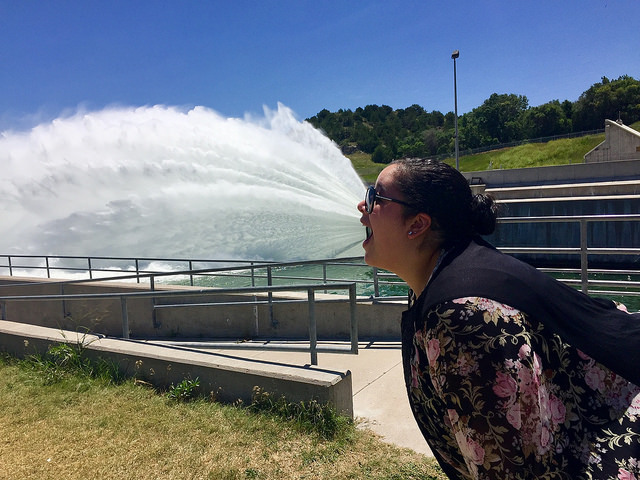 Meghan had a great idea for a funny photo at the dam at Lake McConaughy. Steve took it one step further (and perhaps, a little too far). Gradually, I became more comfortable with the idea of staying off the interstate and away from the rat race of that 4-lane nightmare. At some point, we noticed that signs that said we were on the Lincoln Highway, and not knowing much about that, we Googled it. It turns out we were on the very first road across America that runs from Times Square in New York to Lincoln Park in San Francisco. Who knew? With that tidbit of knowledge in my mind, I was set on staying on this highway as long as we could. 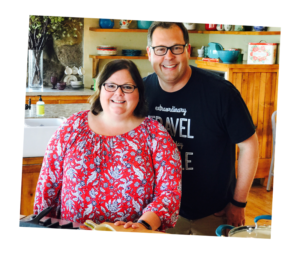 There are lots of interesting things to see and do along the way and each small Nebraska town gave us glimpse of something you just can’t see from the interstate. Sure, you can cross the 100th meridian on I-80, but you won’t know it. 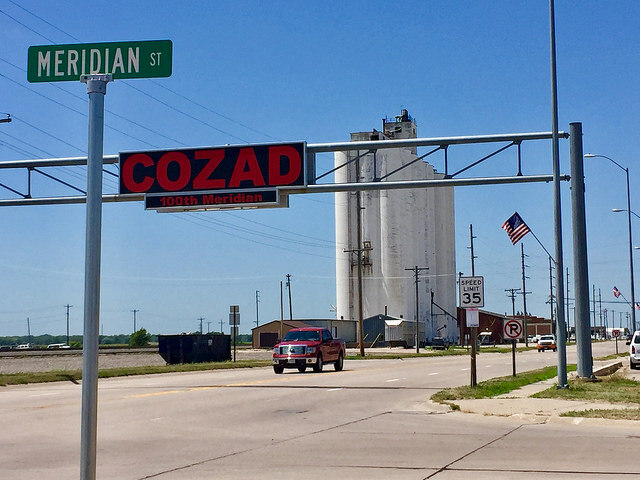 Driving down the Lincoln Highway, Cozad, Nebraska, reminds you of the crossing with a large, lighted sign and a street named Meridian. The 100th Meridian is nicely marked in Cozad, Nebraska, which even has a street named Meridian. Yes, you can stop at a rest area on the interstate for a picnic lunch with all the other weary travelers. You’ll hear cars and trucks zoom past as you eat. Along the Lincoln Highway, we stopped in the small town of Shelton, looked for a park using our GPS, and savored our lunch as we listened to kids playing and birds chirping. Remembering Ann had a cousin in Shelton, we sent a quick text and she and her daughter were at the park for a visit in a just a few minutes. 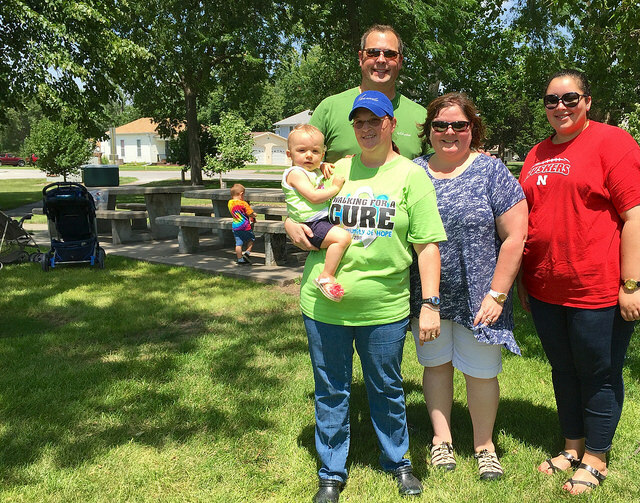 It was great to say hello to our cousin, Rachel, as we stopped for a picnic lunch at a local park. I learned this summer that getting off of the interstate and slowing down makes the trip itself be the destination. You don’t just enjoy where you’re going but taking your time you can also enjoy getting there. That 1,100-mile trip changed me and my outlook on road trips. There came one point where the highway was closed for construction, and the detour took us back to the interstate for 13 miles. It was awful. I couldn’t wait to return to the back roads and a slower pace so I could enjoy the moment. From now on, if time permits, we will travel away from the interstate — there is simply too much to see off the beaten path. Have you ever taken a trip on a scenic highway? Let us know about it in the comments section below. We’d love to hear from you.